Obesity in dogs is a growing issue and industry experts now report that around 50% of pets are overweight or obese. Obesity is more common in certain breeds of dog (including the Labrador Retriever, Cocker and King Charles Spaniels), the risks also increases with age, and gender plays a part too with females being more likely to be overweight, although animals of both sexes when neutered are more prone to weight issues. To help you keep a closer eye on both your dog's diet and their exercise, Pedigree® have developed a free mobile app called Pedigree Tracks which helps you create a tailored menu for your dog and track their daily exercise levels. 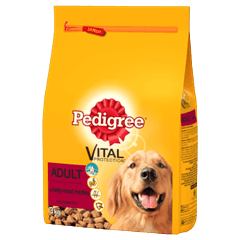 Check out Dog Food products. A Extremely Thin : Your dog has a very small amount or no total body fat. Recommendation: Seek veterinary advice promptly. B Thin : Your dog has only a small amount of total body fat Recommendation: Seek veterinary advice to ensure your dog is offered theappropriate amount of food. Reassess using the S.H.A.P.E. chart every 2 weeks. C Lean : Your dog is at the low end of the ideal range with less than normal body fat.Recommendation: Increase food offered by a small amount. Monitor monthly using the S.H.A.P.E. * chart and seek veterinary advice if no change. D Ideal : Your dog has an ideal amount of total body fat.Recommendation: Monitor monthly to ensure your dog remains in this categoryand have him/her checked by the veterinarian at your next visit. F Moderately Overweight : Your dog has an excess of total body fat Recommendation: Seek veterinary advice to implement safely an appropriate weight loss plan including increasing activity levels. Reassess using the S.H.A.P.E. * chart every 2 weeks. G Severely Overweight : Your pet has a large amount of excess total body fat that is affecting its health andwell being.Recommendation: Seek veterinary advice promptly to introduce a weight loss plan to reduce your dog's weight, increase activity levels and improve health. NB: Some breeds and different llfe-stages may have different ideal S.H.A.P.E scores. Consult your veterinarian if you are unsure.